Amid spike in world anti-Semitism, UK-based journalist in Saudi op-ed finds nothing amiss with 'Jews should be gassed' calls. An op-ed last Tuesday in a prominent Saudi Arabian newspaper justified statements from international anti-Israel rallies calling for Jews to be killed as an "understandable reaction" to the "barbaric war" Israel is conducting in Gaza. The piece in the Saudi Gazette, written by UK-based Pakistani journalist Ali Ashraf Khan, was translated and revealed by the Middle East Media Research Institute (MEMRI). According to Khan, the statement "all Jews should be gassed," a call for a continuation of the Nazi genocidal machine which was heard at recent pro-Islamic State (IS, formerly ISIS) rallies in the Netherlands, was "understandable." "How come they (the Jews) don’t realize or nobody has explained to them that this is an understandable reaction of people who feel helpless in the face of the barbarity that Israel is committing against helpless civilians in Gaza," penned Khan. The UK-based journalist also voiced his support for the international boycott campaign targeting the Jewish state, saying "Twitter and social media are running a boycott campaign telling people not to buy any Jewish items or services related to or tainted with Jewish money. The fallout of such a campaign could outlast the Gaza war for years or even decades." Writing on Tuesday, a day before Hamas breached the last ceasefire which it did against this Tuesday in a repeat performance, Khan claimed "the ceasefire in Gaza has ended and Israel is attacking Gaza once again. No lessons were learnt." Khan concludes with the weighty words "it is the fall of the Western civilization." Some have indeed noted that the horrific anti-Semitic backlash over the Israeli defensive operation in Gaza has "returned to Europe in the 19th, 18th and 17th centuries, dozens and hundreds of years," as stated by Nobel laureate Professor Yisrael (Robert) Aumann. Aumann added that the current UN Human Rights Council (UNHRC) committee to investigate "war crimes" allegations against Israel is a simply manifestation of anti-Semitism. 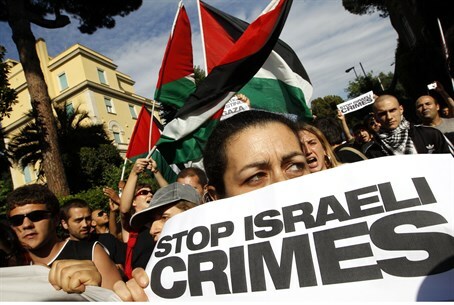 That anti-Semitism has been rampantly revealed as of late amid the biased coverage of Operation Protective Edge; a recent study found anti-Semitic incidents worldwide in July had risen 383% compared to the same month in the previous year.